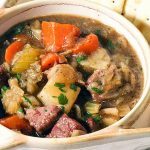 Corned Beef and Cabbage Soup is a savory, hearty meal. As it slowly simmers on the stove top or in the oven the vegetables soften and meat tenderizes. Removed the fat cap from the roast and diced up the beef into bite-sized pieces. Chop the vegetables as directed, set aside. Using a large ziplock bag add the flour, salt, pepper and steak seasoning. Add the diced meat and massage the flour/spices in. In a large stock pot over medium heat add two tablespoons olive oil. Add the beef mixed with flour. Brown the meat well. You'll want to get a good crust on all the sides. About three minutes one side, give it a good stir, 3 minutes again, remove from the pan. Next add all of the vegetables to the pan. (You may need to add additional olive oil.) Sauté for three more minutes. You'll have a bunch of brown bits on the bottom of the pan. Pour the entire bottle of beer into the pot, scrape the bottom of the pot. It might take a minute or two, but you want to scrape up all those brown bits! When you have all of the bits off the bottom of the pan, put the beef back in the pan with the vegetables. It will seem like a lot, but don't worry, they will cook down. After you've added the vegetables, add the beef stock to cover the vegetables. Increase the heat to medium high and bring it to a boil. Once it begins to boil, cover it tightly. Place it in the preheated oven for 1 1/2 hours. ***STOVE TOP*** Once it begins to boil, reduce the heat to low and cover it tightly. Simmer for about 1 1/2 hours until the beef is tender. Check it occasionally and just give it an occasional stir. Remove the soup from the stove or oven, finish by adding a good handful of minced parsley. Stir well and serve.